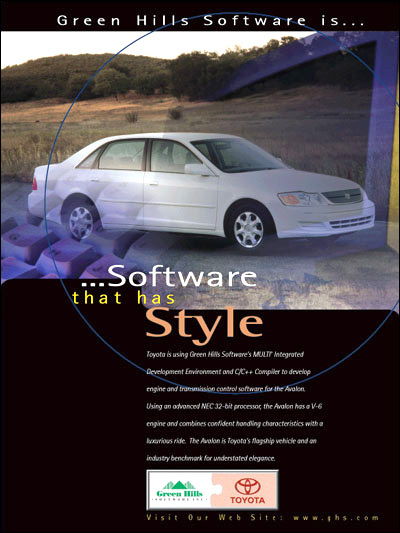 Toyota is using Green Hills Software's MULTI® Integrated Development Environment (IDE) and C/C++ Compiler to develop engine and transmission control software for the Avalon. Using an advanced NEC 32-bit processor, the Avalon has a V-6 engine and combines confident handling characteristics with a luxurious ride. The Avalon is Toyota's flagship vehicle and an industry benchmark for understated elegance.